We're very happy to announce a small but powerful enhancement to the metadata export tool found in every SourceAudio music search and distribution site. The next time you access your metadata export tool you'll notice that you have a few more options to play with. Instead of downloading your entire database every time you want to work with a spreadsheet, you can now identify subsets of metadata to download to a spreadsheet making metadata updates easier than ever. 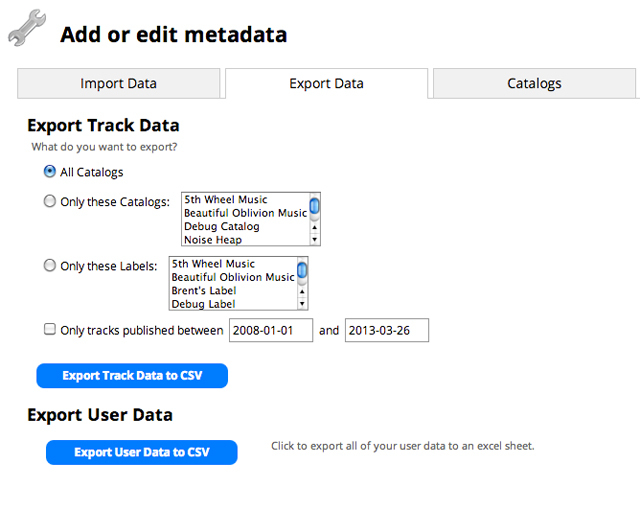 The track publish date ranges are great because if you know you published a bunch of tracks in the past week and only want to work with the metadata on those files, you can go back one week with the date selection tool and export only the metadata for those most recently uploaded and published tracks. This should really speed up the amount of time you spend working on your metadata. We hope you enjoy this new improvement and as always, there's MUCH more coming soon!